As more and more PCs are being manufactured with touch screens, one annoyance I found was how Adobe Acrobat would always enable Touch Mode by default. Acrobat would enable it every time I opened a document, even if I went to View > Show/Hide > Toolbar Items > Uncheck Touch Mode. Luckily, you can go into Preferences to disable touch mode in Adobe Acrobat. 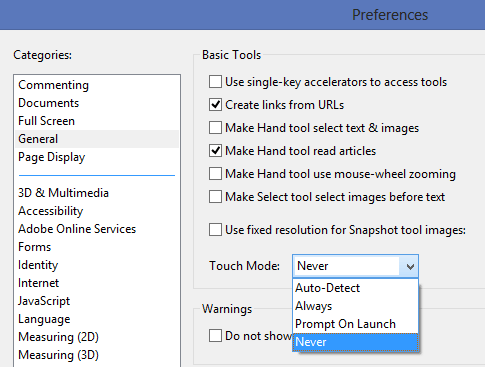 If you’re planning on deploying Adobe Acrobat across an organization and you want to use the Adobe Customization Wizard interface, you can disable Touch Mode in Adobe Acrobat for all users you deploy it to. Install Adobe Acrobat on your computer. Follow the instructions above to set your desired setting from the Preferences menu. Install the Adobe Customization Wizard (Free download, scroll to the bottom of the page in the Utilities section and download the version that matches your Adobe Acrobat). Launch the Adobe Customization Wizard. FIle open package. Navigate to the install folder and select the .msi file. Make any other customizations you want. If you’re in a Windows Active Directory environment, you can use Group Policy to push out settings to all of your users. You can view the Adobe Admin Guide For Group Policy. Adobe offers a starter Group Policy template. If you scroll down, you’ll find some information on adding your own registry preferences into the Adobe Acrobat Group Policy Template. You can use the registry keys above to create your template.